The Alligator Ready Set Staple Fastener System features strips which are one piece with pre-inserted staples. 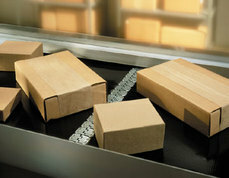 This system reduces installation time by taking away the requirement to handle and load individual staples. Simply fit the fastener strip onto the belt ends and secure with the special installation tool for a strong, dependable splice. 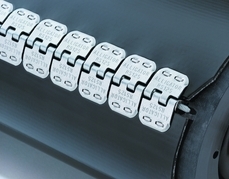 This fastener is designed for belts from 1/16" (1.5mm) to 1/4" (6.4mm). The only tools required are a hammer and the lightweight RSC187 installation tool which is available on it's own or as part of a kit. The result of using the Ready Set staple fastener system is a strong splice that resists impact damage, as well as a smooth, unrippled joint that simplifies hinge pin insertion. 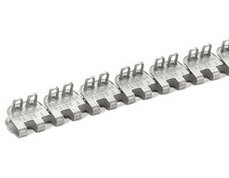 Due to it's design of extended plates, which seperates the point of staple penetration from the line of belt flexing you can be sure that maintenance will not have to be carried out too regularly. With pre-inserted staples and a one-piece strip design, Alligator® Ready Set™ makes splicing quick and easy.